It would be nice to make the game a little bit sweeter and kinder. In this category you can basically find files which will add bosses or hordes of enemies. But after installing the Tameable Rabbits Addon, you get a peaceful rabbit. Of course, the rabbit is useless for you and will not help you in battles. It can not carry your things, can not trade. Its only function is the decoration of your house, because it can only survive in your home. Everything is as usual. Take a carrot and wait for the Tame button using long tap. After that, the rabbit will run behind your back. It has very few health points, so take care of it. The rabbit can not attack anyone, so it is desirable to bring it into the house. Also, you can tame several of these animals and give them names. It is best to build a small cage for every pet. 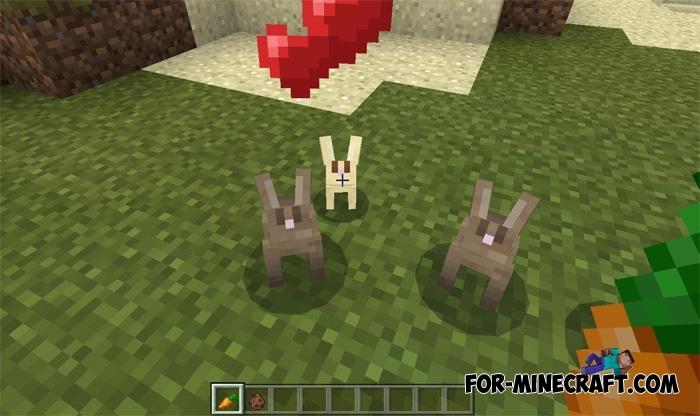 How to install the Tameable Rabbits mod? To remember how to install add-ons, use this instructions.